Hey guys. Wolvenciel here. I messed up big time. I was supposed to post this review like in the afternoon but I got sidetracked by stuff. Simulators are kind of addictive so yeah forgive me for posting in the middle of the night. I also planned this to be a "starter kit" post rather than a review but again, I messed up. 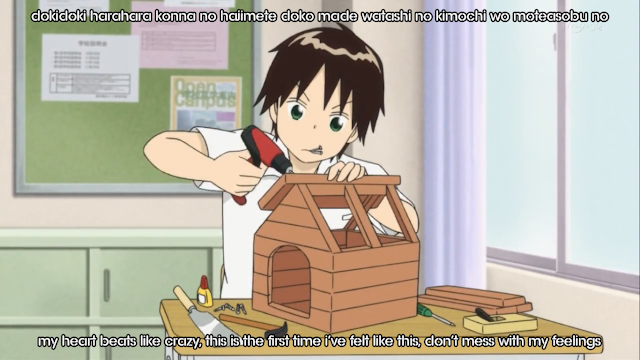 So here's Tonari no Seki-kun. This is going to be a short review because I'm rushing and all that so I'll skip the subtitle crap. The anime is technically about this boy Seki who takes fooling around in class to a whole new level and how Yokoi, the girl sitting next to him is always swept along his antics. 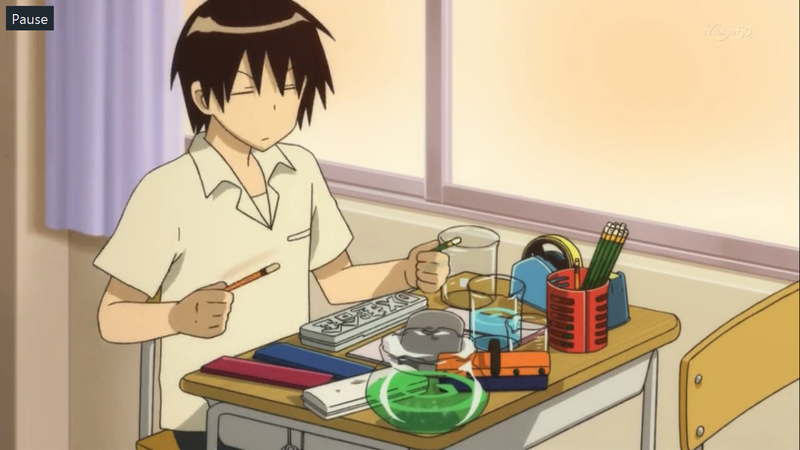 So yeah each episode of the anime shows a different method of Seki killing time in the classroom and making life as exciting as possible (albeit not actually taking notes and studying in the classroom). The duration of an episode is only about 7 minutes so it doesn't really have that deep plot or anything to it. Just purely about this boy fooling around in class doing unbelievable stuff and being unbelievably stealthy while doing so. 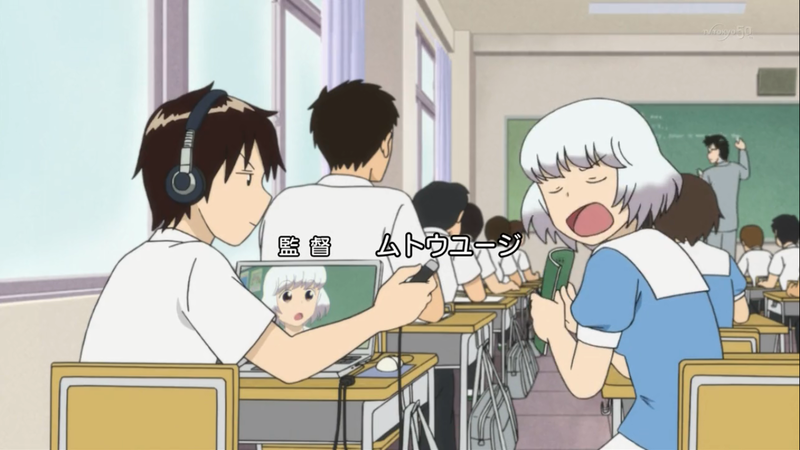 Then there's the girl sitting next to him (and the one doing all the talking and getting into trouble), Yokoi. 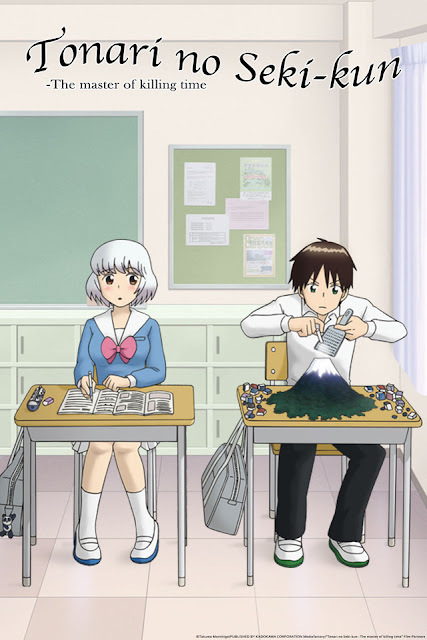 The anime is shown from Yokoi's point of view and of her trying not to get carried away with the distractions that Seki comes up with in which she always failed to do so (you have to admit what he brings to class is interesting as hell). There are also occasions where Seki implores on her to join in his shenanigans and Yokoi being Yokoi, can't help but agree to his wishes. There are cases where Seki brings stuff that he brought to school previously and believe me, even if its the same stuff, he takes it up a notch EVERY SINGLE TIME. 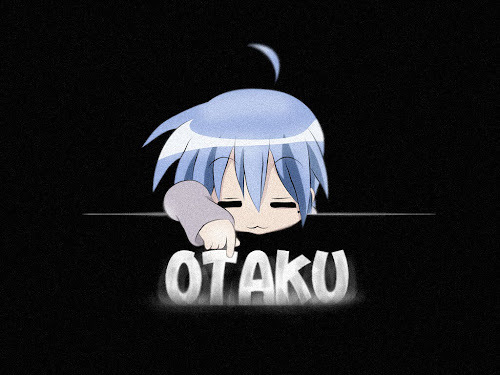 Every moment you watch this anime you'll be caught off guard by how creatively Seki shapes his activities and in Yokoi's case, by how dramatically she reacts to everything that Seki does (I swear to god the girl can open a reaction channel and she'd be a smash hit or something). 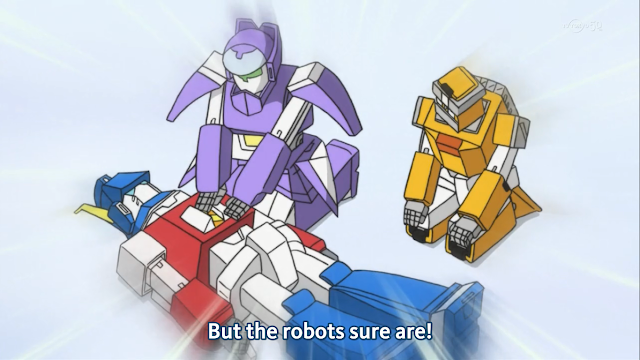 And robot kazoku. Is golden. The opening song practically spells out what Yokoi feels about Seki and his antics and you just can't help but listening to it every time the anime plays. And the ending song. I'm sure you guys (boys I mean) did this during your school days. You know, playing around with your pencils and using them as drum sticks. He friggin pulled a jazz tune using a bunch of pencil boxes and various stationery and its damn catchy. 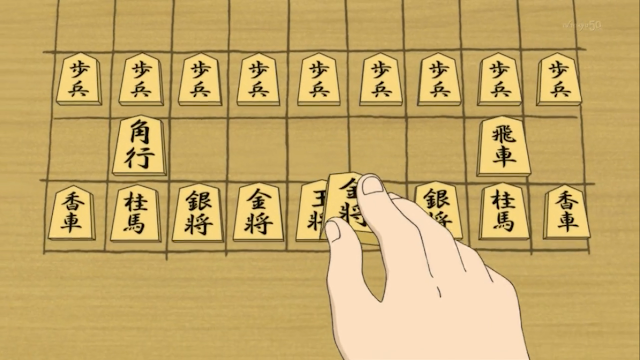 Yes the background music did help, but the beat that he set up just reminds you of those days, you know? Yeah well he did have one too many instruments laid out but still. Reminds you of the old days doesn't it? All in all, the anime would probably be suitable for those of you looking for a moment's reprieve from watching a heavy-plotted anime or when you're having a hard time in the unfair 3D life. I promise you, there is never a dull moment with Seki. Sure, he doesn't talk in the anime but that makes his expressions all the more priceless in my opinion. The one thing I'm sad about the anime would be that there is only about 22 episodes altogether (counting in the specials and all). Its not enough, you know. One person once said, "If the anime leaves you wanting for more, its good".